Commissioner Katsuhiko Kumazaki of Nippon Professional Baseball highly valued this event, particularly because global development of the sport helps reinstate baseball and softball to 2020 Tokyo Olympics. For the first time in WCBF’s history, children from Myanmar are invited to join Canada, China, Chinese Taipei, Denmark, Fiji, Germany, Hong Kong, Korea, Malta, New Zealand, Peru, Philippines, Switzerland, U.S.A. and the host Japan. Team Myanmar will be lead by Toru Iwasaki (59) who used to work with the United Nations, now resides in Yangon with his wife after retirement and helps promote baseball as volunteers. The girls and boys 10-11 years old will learn from veteran coaches to play baseball and participate in cultural and other sport events to create goodwill and friendship. The World Baseball/Softball Confederation (WBSC) nominated 10 coaches headed by Angel Bonilla (USA). 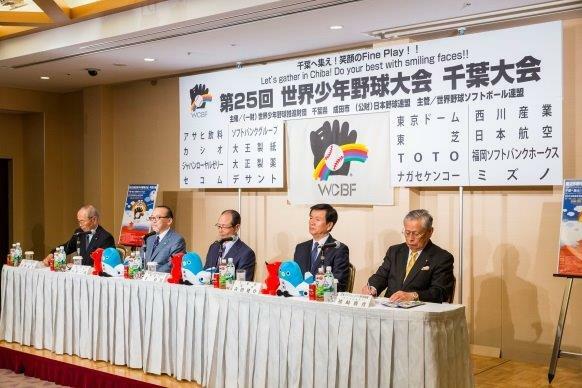 Children’s baseball teams from Chinese Taipei and Korea will play friendly games with 12 teams in Chiba Prefecture. The WCBF inaugural event was held in Los Angeles in 1990, and nearly 5200 participants - boys and girls of 10 and 11 years old - from 93 countries/regions (including Myanmar), will have attended this global event.